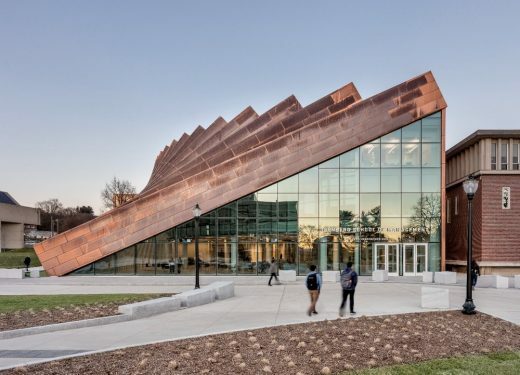 Designed by BIG-Bjarke Ingels Group and Architect of Record Goody Clancy, the copper-clad Business Innovation Hub at the heart of the University of Massachusetts Amherst adds 70,000SF of hyper-collaborative study and social space to one of the top-30 public business schools in the United States. 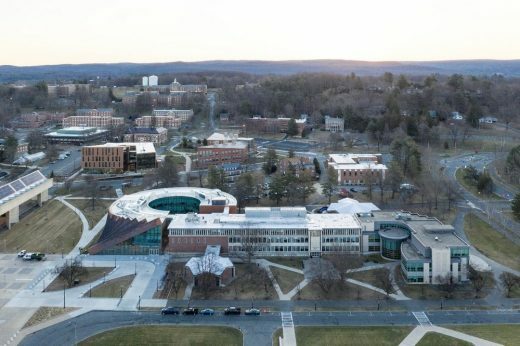 The new expansion and partial renovation of the Isenberg School of Management Building nearly doubles the school’s current space to accommodate Isenberg’s growth in the last decade, while introducing new facilities for more than 150 staff and 5,000 students in undergraduate, master’s and PhD programs. 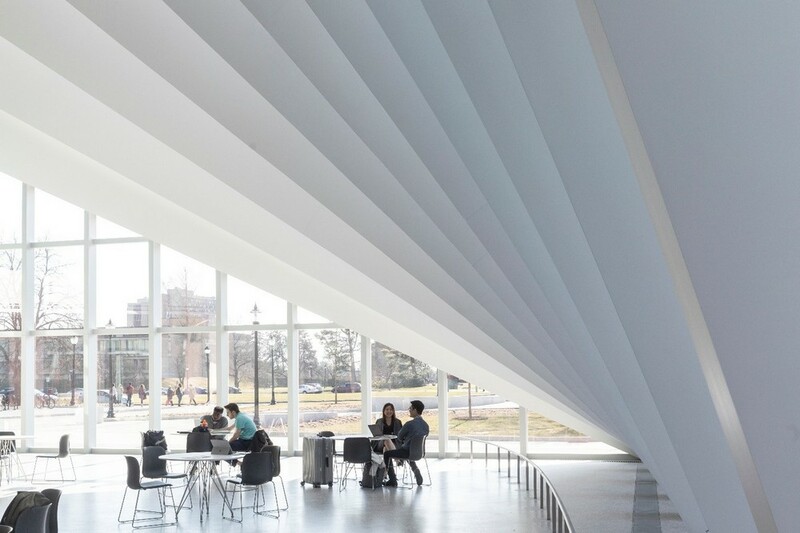 BIG and Goody Clancy were commissioned in 2015 to design a flexible space that inspires and facilitates collaboration for every Isenberg student. “As a top business school, we want to offer our students, faculty and staff an environment that inspires creativity, communication, innovation and collaboration—a physical space designed to train and prepare students for careers in the 21st century. The new Business Innovation Hub clearly reflects our mission and vision for the future. 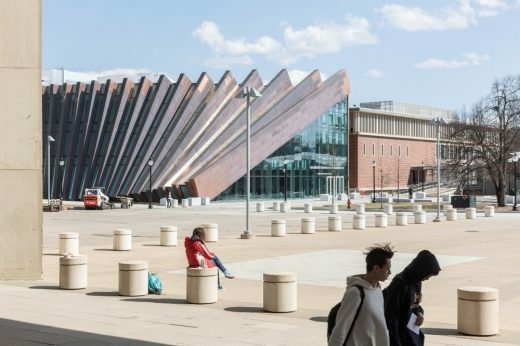 Equally important, with flexible spaces and state-of-the-art tools and technologies, the Business Innovation Hub will continue to meet the rapidly evolving needs of the Isenberg community.” Tom Moliterno, Interim Dean, Isenberg School of Management. Prominently situated on Haigis Mall near the entrance to the campus, a dramatic triangular glass entrance created by a domino-effect greets students. 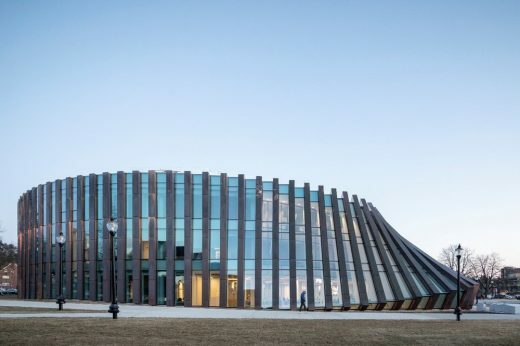 The building exterior is wrapped in straight, vertical pillars that gradually slope downward, creating a distinct appearance without any curved elements. The Business Innovation Hub directly extends the school’s existing 1964 building from the north and east sides in a wide circular loop, linking back on the upper floors to maintain connectivity. 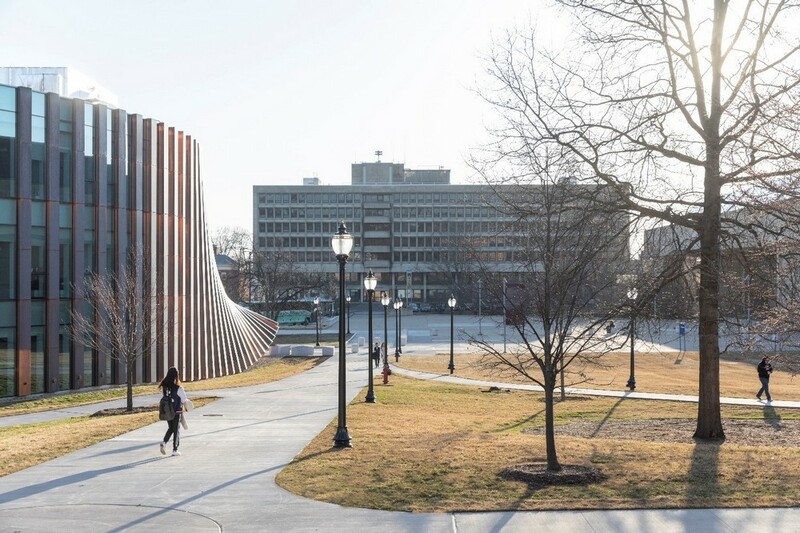 The loop consolidates Isenberg’s faculty and staff under one roof, creating a singular place of arrival and a strong visual identity for the entire Isenberg School of Management. 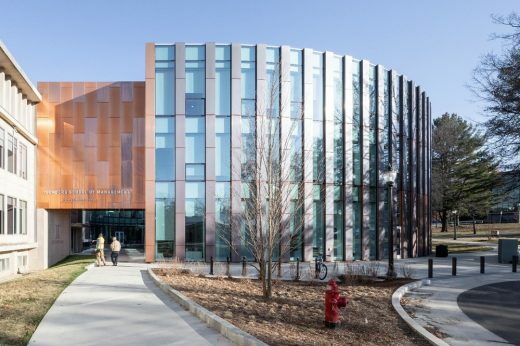 The Business Innovation Hub’s exterior is clad in copper, so long-term exposure to the elements will naturally weather the metal from a dark ochre to an enduring patina. 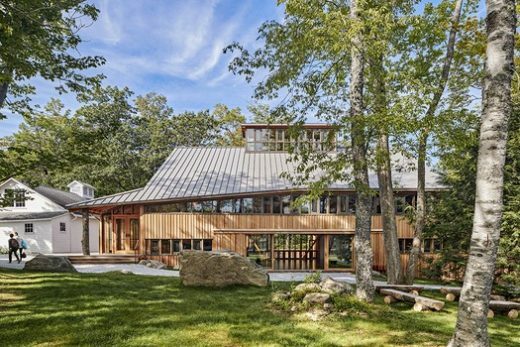 With longevity and sustainability in mind, the building also targets LEED Silver certification. 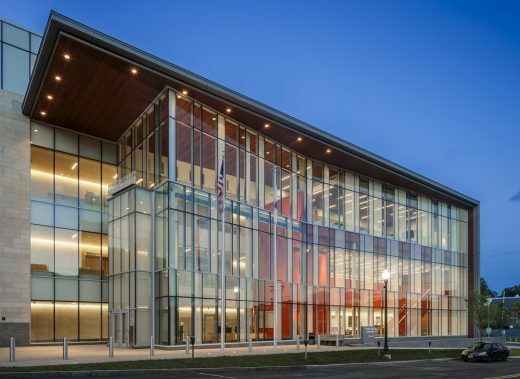 “There’s no other building at UMass Amherst that’s going to look remotely like this. Isenberg is trying to raise its profile among peer institutions. We have no doubt this will help Isenberg attract the best and brightest faculty and students.” Roger Goldstein, Principal, Goody Clancy. Upon entering, students and faculty arrive at the 5,000SF Learning Commons. Daylight peers between the accordion-like pillars to illuminate the multi-story atrium, where the heart of the business school hums with students learning, networking and dining. The bright and spacious Learning Commons doubles as an event venue for guest speakers, award ceremonies, banquets and career fairs. 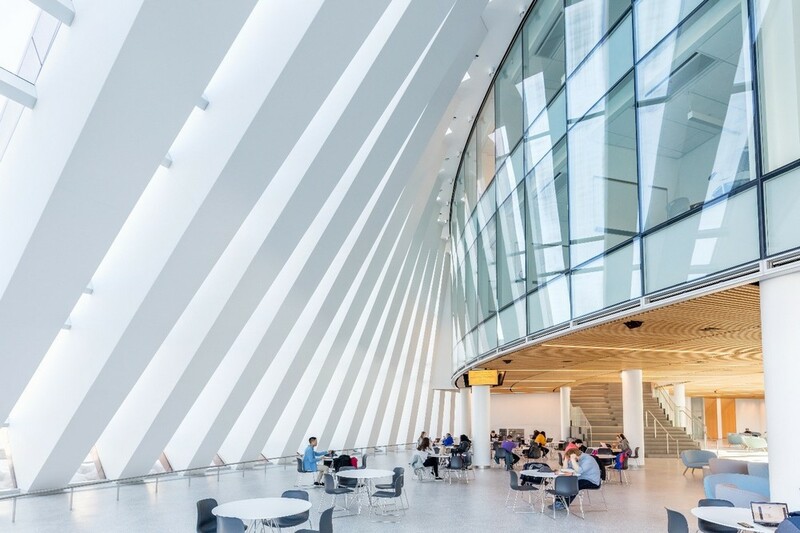 In any room or hallway, natural light reaches inside from both the campus and the inner courtyard. 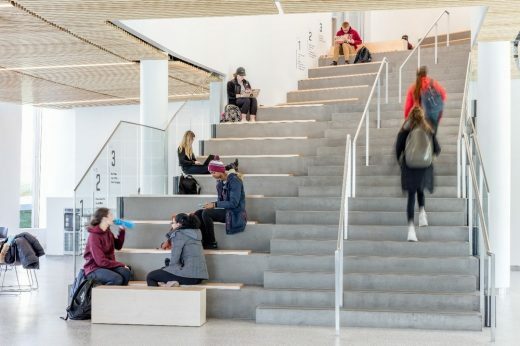 Throughout the Business Innovation Hub, spaces are designed with student interactions, teamwork and chance encounters in mind: soft chairs adorn the corridors, benches are affixed to the grand stairway and classroom chairs can easily maneuver for theater-style lectures or small group work. On the second and third floors, students and staff occupy the innovation labs, advising spaces and faculty offices. To support the career development of every Isenberg student, classrooms are equipped with integrated technology for distance learning. In addition, the Chase Career Center gains 15 new interview rooms, and various conference rooms and breakout areas are distributed throughout the loop. The inner spaces of the extension face a circular courtyard, where an open-air garden and stone benches create an oasis for collaboration and contemplation. The courtyard connects back to the campus via two pathways between the original Isenberg building and the Business Innovation Hub. The buildings are fused by two bridges above the paths: the large bridge cloaked in copper becomes the gateway to the courtyard while the small bridge glazed with glass forms a visual continuity around the interior courtyard. 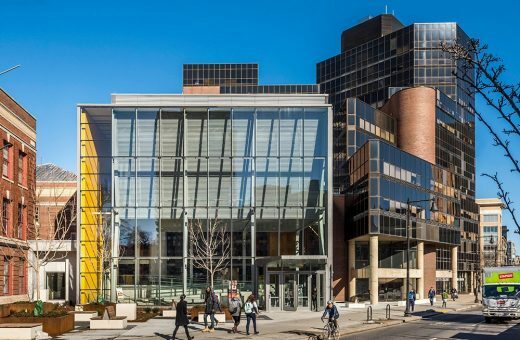 In the evening, the Business Innovation Hub glows from the life within—appearing as an inviting beacon on the campus and creating a lasting impression for campus visitors, staff and students.